It is a well-known fact that prayer has the power to heal, and that is why the devout consider it to be a very effective and powerful medicine against sickness. Even science also supports the importance of prayers in restoring the health of believers. 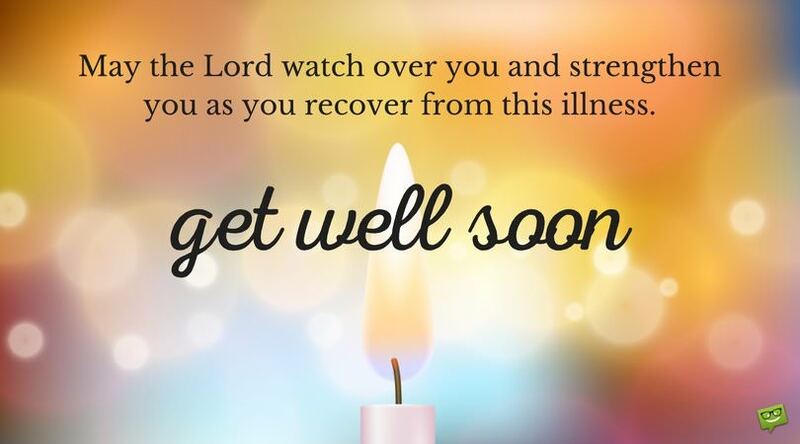 And since we know how powerful the healing powers of prayers can be, we have loaded this page with a compilation of some of the most touching “get well soon” prayers that you can find on the Internet. Sending any of our well-crafted prayers for the quick recovery of your loved ones will not only let them know that you’re thinking about them as they battle illness, but it can also significantly help them feel better and recover faster from anything they suffer from. Put a smile on your face; don’t let your illness get you down. Remember that the almighty God is in control, and by his son Jesus’ stripes you shall be healed. We love you, dear. Dear daughter, my only prayer for you right now is that the good Lord bless you with good health, so that I can see you smiling and laughing once again. I miss that. Please get well soon. The sickness’ grip on you will be broken as soon as possible because the Lord is with you. Get well soon, dear daughter. Lord, I pray for quick recovery and renewed strength for my little angel. Please strengthen her as she lays sick in bed. Get well soon, sweetheart. Princess, I pray to God to heal you, knowing that He is the stronghold of your life and that with Him all things are possible. I believe my prayers have been answered and that it is only a matter of time before you’ll be fit and strong again. Get well soon. May the good Lord, who gives strength to the weak, give you all the strength and power you need to get up from your sick bed and bounce back to normalcy. God bless you, my sweet daughter. 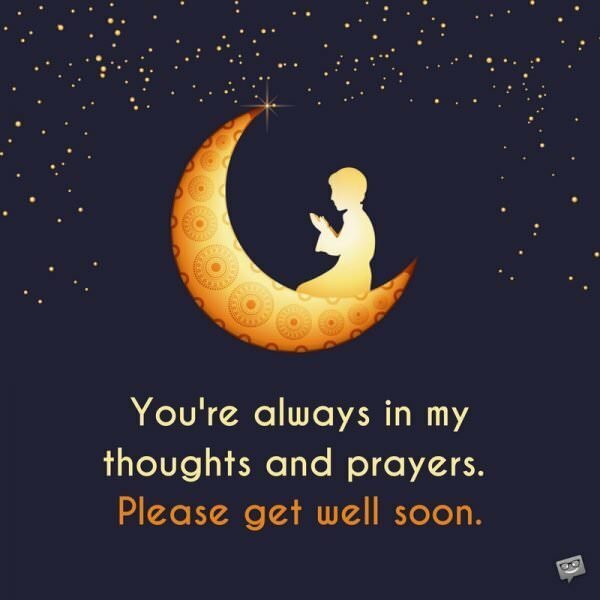 I strongly believe you’ll get well soon. May the Lord bless you with a smooth and swift recovery from this illness. Feel better soon, my son. Son, I pray that every new day brings you more strength and health than the day before. Remember that God cares for you and He will certainly give you fast relief from this illness. May the almighty God, who is capable of making the impossibility possible, heal you and give you strength. God bless you, my son. May the love, peace and comfort of the good Lord be with you as you battle this illness. God will heal you very soon, so don’t feel down, my son. God will give his children anything if only they ask him, which is why as I pray for your health, I believe that God has answered my prayers and has already started healing you. Smile, my son, for everything is under control. Nothing is impossible for God, and healing you from this sickness is definitely no exception. Get well soon, son. Remember that you’re not alone in the battle against your illness, for the Lord is with you now and forever. He will help you defeat this illness so that you can regain your lost strength and feel normal again. Get well soon. You shall get well soon because my prayers are with you all the time. God bless you. Mom, the grip this sickness has over you won’t last long because I believe God will answer our prayers and heal you from this illness that is keeping you down. Smile, for you’ll soon rise up stronger and healthier than ever. One of the most powerful medicines against sickness is prayer, and with all the prayers I’ve said for you, I don’t believe that this sickness is going to keep you down any longer. You shall get well very soon because I believe my prayers have been answered. May the Lord watch over you and strengthen you as you recover from this illness. Get well soon, Mom. Today, I pray for your recovery, Mom. May the comforting and healing hands of the Lord cover you and free you from the grips of your illness. In Jeremiah 33:3, the good Lord promises to answer us whenever we call unto Him, which is why I’m hundred percent confident He will answer my prayers and restore your health and strength. Get well soon, Mom. To my wonderful Mom, I pray for your quick recovery. I know that God will never leave or forsake you in your time of need. Continue to put your trust in Him and everything shall be alright. You’re always in my thoughts and prayers. Please get well soon. Dad, while it breaks my heart to see you battle with ill-health, I take solace in the fact that God, who is forever compassionate, will answer my prayers and heal you and make you feel better soon. Dad, as you battle this illness, know that you are not in it alone, for I’m supporting you with my prayers. And I know that the good Lord, who constantly watches over us, will boost your strength and bless you with good health. You’re always in my thoughts and prayers, Dad. Please get well soon. Today, I ask for God’s divine healing presence in your life. I pray that He takes away your illness and restores your strength. Since God cares for us and answers our prayers, I believe that you have already received your healing, Dad. 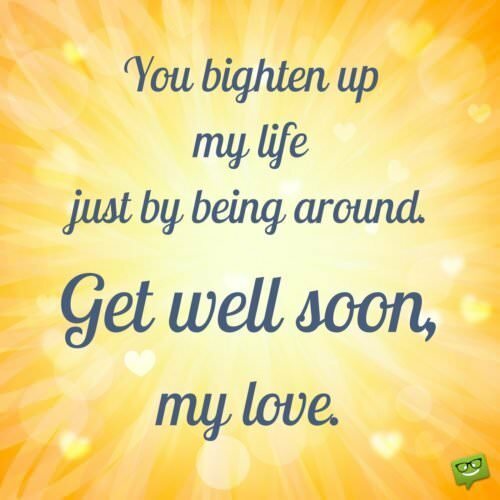 I pray that you’ll soon recover from your illness. May God envelope you with good health and strength so that you’ll be back on your feet as quickly as possible feeling as healthy as a horse! No matter how you feel, please don’t lose your faith in the Lord. Open your heart to the Lord, for He will touch you with His healing hands and restore you to good health. May the Lord watch over you and strengthen you as you recover from this illness. Get well soon. I believe that God hears and answers our prayers, which is why I am praying for you today. I pray that you feel better and stronger with each passing day. Get well soon, my dear. Always put your trust in the Lord, for He will not only bring you out of this sickness but will also heal your soul. Get well soon. I pray that the angels of God watch over you and break the grip this illness has over you. Get well soon, my dear friend. As I pray for you today, I ask the Lord to free you from the grip of your illness and bring your health and strength back to you as soon as possible. Get well soon, my good friend. I believe that the Lord will watch over you and heal you from this illness, buddy. Just have faith. Everything is going to be alright, and you’re going to be feeling as healthy as you’ve never felt before. Please get well soon. I know that you’ll soon regain your strength because I’m praying for the almighty God that we serve to heal you with His amazing healing hands. Get well soon, for I miss your smile.